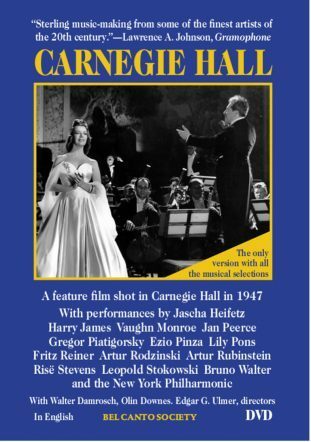 Feature film made in Carnegie Hall, in English. (1947). 144m. B&W. Edgar G. Ulmer, director. Starring Marsha Hunt, with Walter Damrosch and Olin Downes. 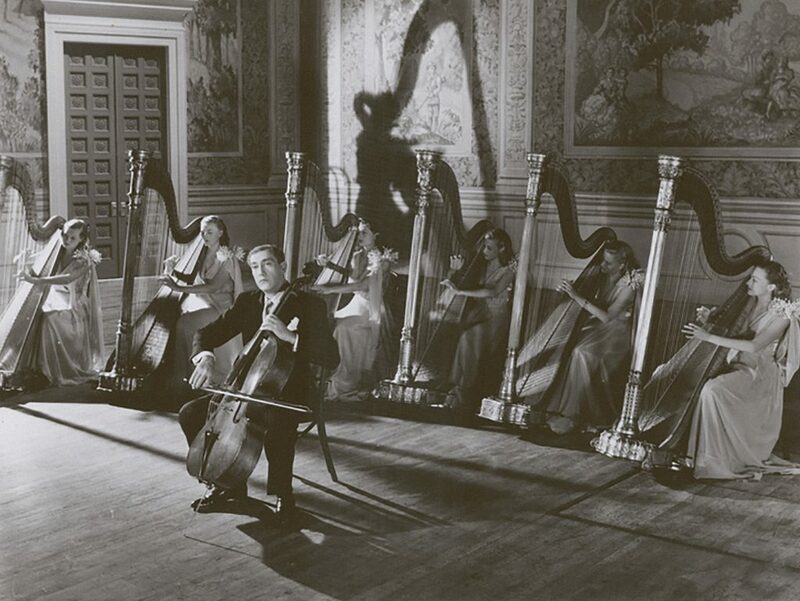 Performances by Jascha Heifetz, Harry James, Vaughn Monroe, Jan Peerce, Gregor Piatigorsky, Ezio Pinza, Lily Pons, Fritz Reiner, Artur Rodzinski, Artur Rubinstein, Risë Stevens, Leopold Stokowski, Bruno Walter and the New York Philharmonic. Other versions of the film omit some of the music and have distorted soundtracks. The BCS version is full length, with all the music. The soundtrack is distortion-free. “The main interest in Carnegie Hall now stems from footage of artists, which is worked into the narrative, often artlessly so. Bel Canto has provided a master video of sorts, including all alternate musical scenes shot for different versions. “Artur Rodzinski directs a driven final movement of Beethoven’s Fifth Symphony, marred by the decidedly non-historical use of five horns and triple woodwinds. 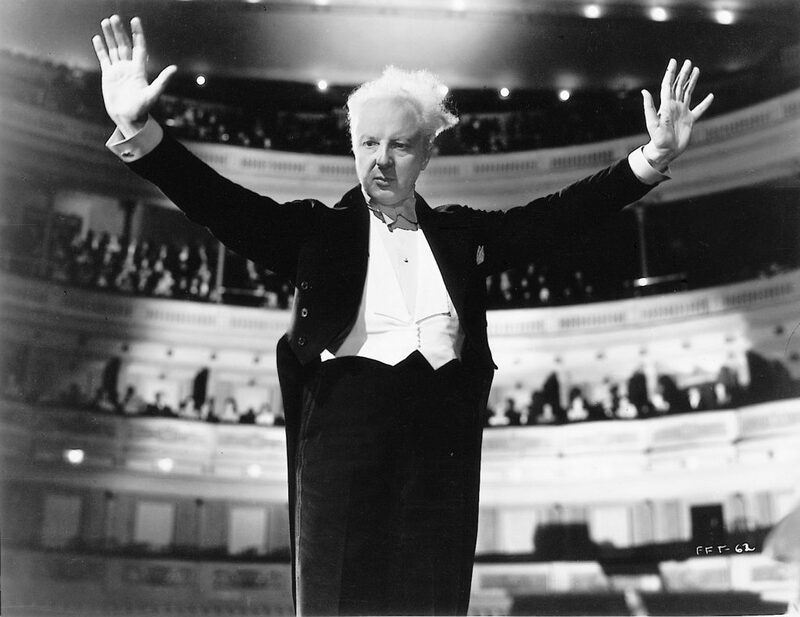 A ramrod-straight Artur Rubinstein is magisterial in Chopin’s ‘Polonaise in A flat’ building torrential keyboard sonority, followed by a fiery yet elegant ‘Ritual Fire Dance’ of Falla. Bruno Walter conducts a richly dramatic Meistersinger Prelude, and Jan Peerce is personable yet rather stentorian in his ‘O sole mio’. “Gregor Piatigorsky performs a beautifully refined rendering of Saint-Saëns’ ‘The Swan’. 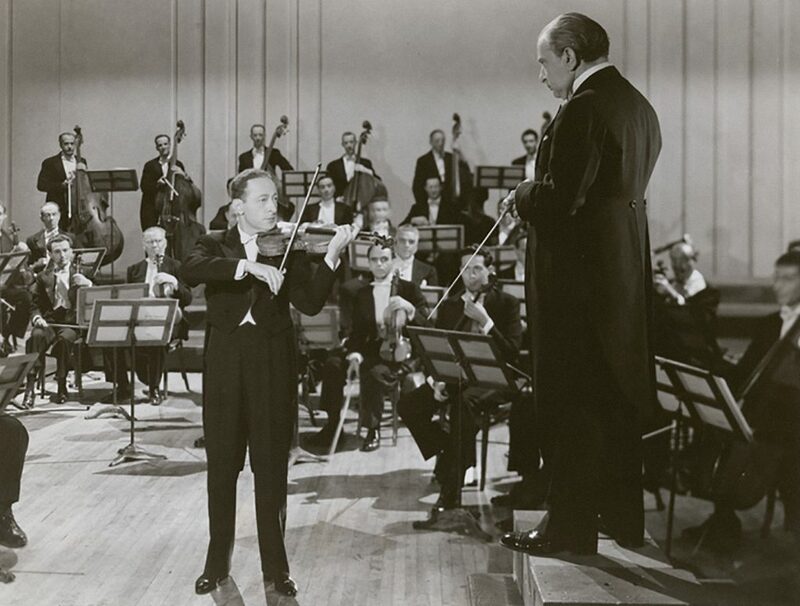 Yet the highlight of the entire film is a magnificent scene featuring the first movement of Tchaikovsky’s Violin Concerto with Jascha Heifetz and Fritz Reiner. Even with cuts, this blazing performance offers polished and remarkable close-ups during virtuosic passages. The stylish filming of these two sequences is even more striking given the wooden direction of the film’s main narrative. An employee of Carnegie Hall wants her son to be a musician and raises him in the hall. They attend performances by many greats of the day. 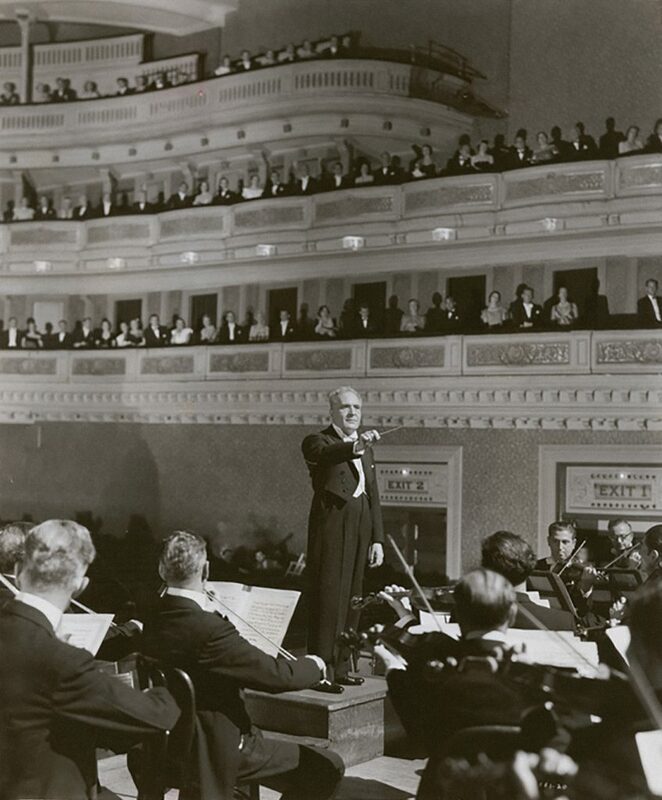 Other music includes M. & W. Portnoff, “57th Street Rhapsody”; Gregory Stone, “Sometime We Will Meet Again”; and portions of Tchaikovsky, Piano Concerto No. 1, First and Third Movements; Schumann, Piano Quintet, Second Movement; Mendelssohn, Midsummer Night’s Dream, “Wedding March”; Beethoven, Fifth Symphony, Second Movement; Haydn, Sonata in F for Piano (Hob. XVI:23); Mendelssohn, Songs Without Words, “Spinning Song.” The film includes piano recordings by Nadia Reisenberg, Dorothy Eustis, Walter Gross, David Saperton and Rosa Linda. 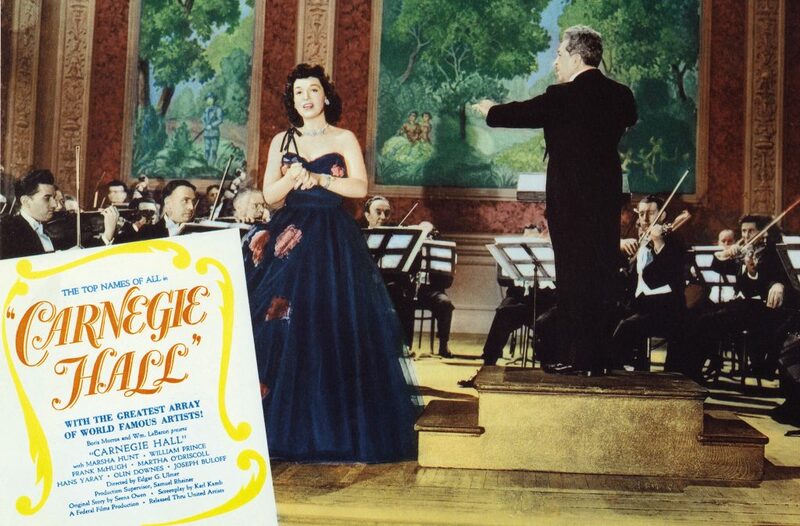 Original 1947 versions of Carnegie Hall differed from one another. Some were released with certain musical selections abridged or omitted; some omitted portions of dialog. We pieced together our print from four sources to include all the material.